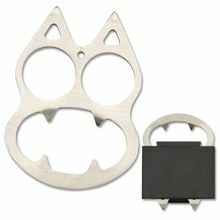 This unusual Cat Buckle Self Defense packs a mighty punch! The eyes of the cat are finger holes and the ears become spikes to create an excellent means of self-defense against an attacker. This lightweight cat buckle looks non-threatening, is easy to carry, and can provide peace of mind. Comes with its own belt carry holder. Or can easily slip into pocket or purse. Only 3 inches long. This bad cat has eye holes about a 12 ring size. That will fit most people up to their 2nd knuckle. Notice: We cannot ship this item to CA, NY, MA, or TX. Consider the plastic cat keychains instead.